In The After started with a bang.. or more accurately towards the book, a silent implode. Because in this world, in order to survive, you have to stay silent, every second of the day. The book is set a couple of years after the apocalypse, with a bit of flashbacks in the beginning to set up the world building. We meet Amy, the sole survivor in her family that consists of her tree hugging father and scientist mother. The only reason she was able to survive was because her family basically set her up with the extra protection her mother took, such as adding an electric fence around the house, and with her dad's organic garden as well as solar panels. This apocalypse will make you learn to breath, walk, eat, and sleep without making a single sound, or else They will come. They have supersonic hearing, are lightning fast, and will eat anything that walks across this earth. The beginning of the book was frighting and very sad. Just seeing how Amy found herself all alone in this monster infested world and having to fend for herself indefinitely. Then she finds Baby.. a four year old, in the middle of a supermarket. I have to say that I loved the relationship dynamic between Amy and Baby. Baby truly saved Amy's humanity. She was becoming ruthless and emotionless, traits that you need to acquire if you start living in a world full of monsters as well as other survivors that are ready to kill for anything. The sign language they molded to fit them was fascinating. Baby herself was so mature (the book was set around three years after Amy found Baby so she was around seven years old). I have to say, I enjoyed reading about them and how they were surviving. I love survival books and that was why I enjoyed this part of the book. Unfortunately it wasn't all excitement and action going on. This book is split in three sections; The first is what I mentioned, while the second and third were set in New Hope, a sort of camp that housed thousands of survivors and was protected by the most high tech devices and weapons that can be found. When Amy and Baby find themselves in New Hope.. I found myself drifting off and missing the thrill and action of when they were outside. As the synopsis mentions, New Hope isn't the dream place everyone believes it to be. This part of the book felt more dystopian but I personally felt it was lacking. Flash forwards get thrown at us that I did not appreciate as well as a random romance that didn't progress smoothly, but only appeared sporadically. In terms of shocking revelations, Lunetta knows how to write them because I was seriously shocked towards the end of the book. However, I didn't enjoy the whole idea of The Ward and I felt like how the patients were, confused, drunk like, and trying to figure out what the hell is going on. I just felt that nothing much happened in the last two parts of the book. Also, I was quite bummed that Amy and Baby were barely together, their scenes were very short. This was disappointing since they were the heroes of the first part of the book. 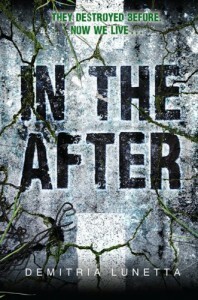 All in all, In The After was a fantastic post apocalyptic novel with a ton of action (at least the first part) as well as big and shocking revelations that will make you want to pick up the second book immediately.